This rare book Fabulous Redmen first edition in its original dust jacket - The Carlisle Indians and Their Famous Football Teams" Thorpe's inscription, reading "Me Too, Jim Thorpe" follows a personalized greeting from author John Steckbeck, whose inscription and autograph are equally strong. 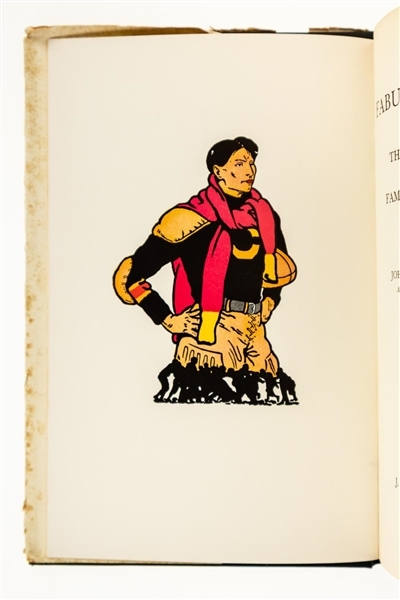 The hardcover first edition remains in quite strong condition, with the majority of the wear confined to the complete and original dust jacket. Thorpe autographs are quite tough, as most football collectors know, and even more desirable in any format that links directly to his history at Carlisle. 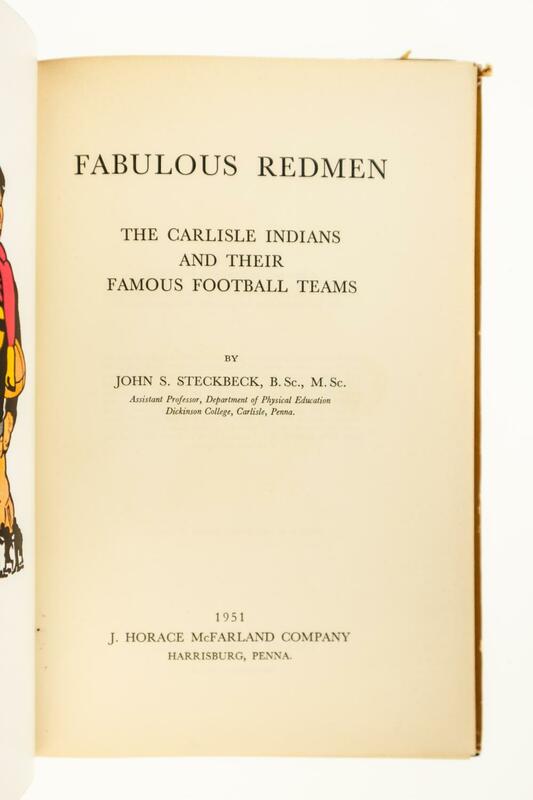 The Author, John S. Steckbeck served as a professor in the Department of Physical Education and was the swim coach at Dickinson College in Carlisle, Pennsylvania, in the early 1950's. Steckbeck has been inducted into the American Indian Sports Hall of Fame, and received awards from the New York Touchdown Club and Harrisburg Sports Writers Association. 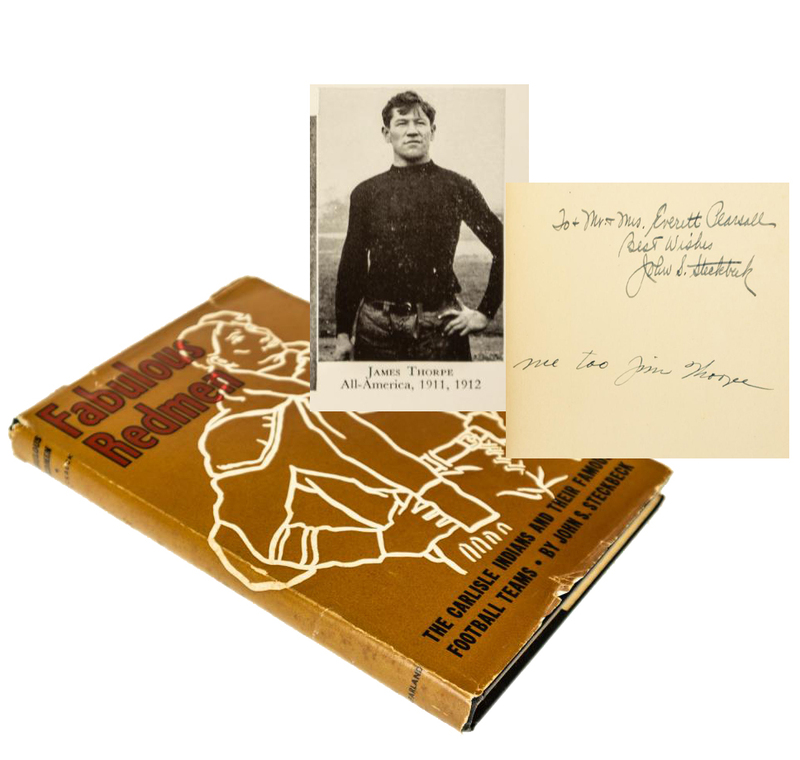 This rare, signed copy of this football history bears not only the author's signature but also that of celebrated Native American Olympic athlete, Jim Thorpe. 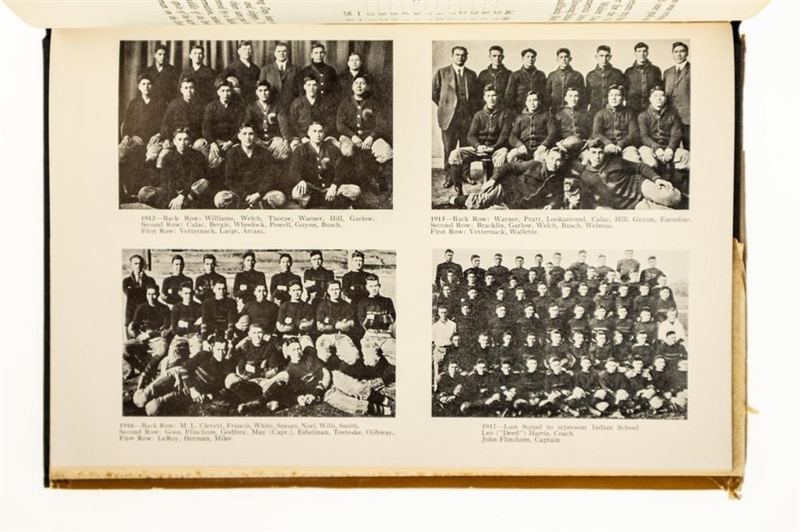 The book contains many photographs of teams, players and other individuals and Jim Thorpe appears in at least one of the photographs. 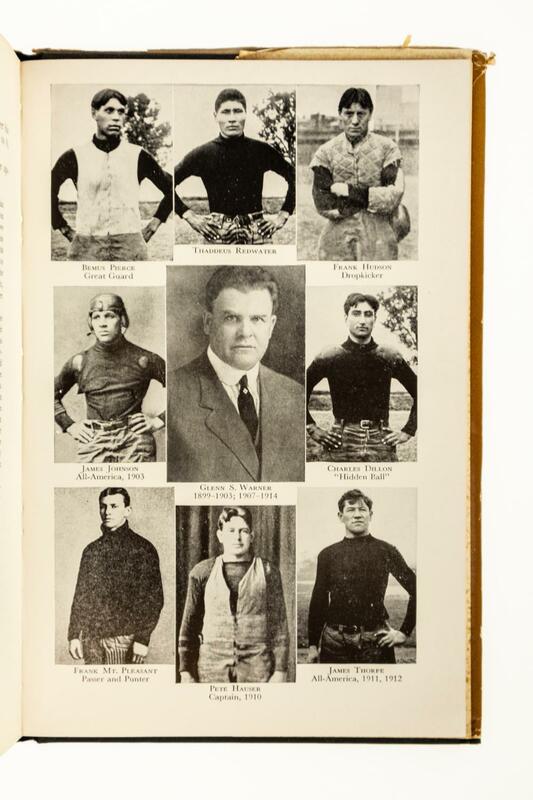 There is now a town in Pennsylvania named for Jim Thorpe. 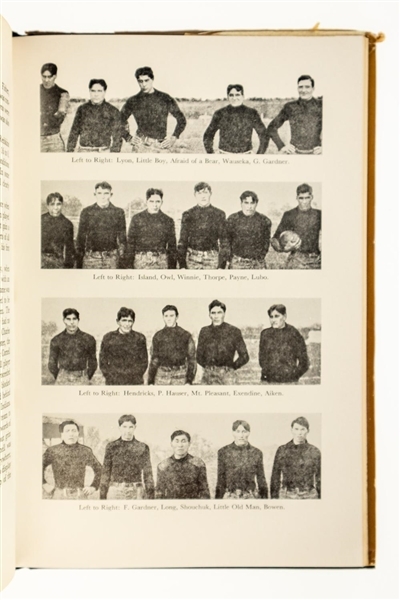 The book also contains a bright, color frontispiece image showing the iconic team logo. From the dust jacket: James Francis [Jim] Thorpe, or Wa-Tho-Huk, (translated as "Bright Path") lived from 1887 to 1953) and was an American athlete and Olympic gold medalist. 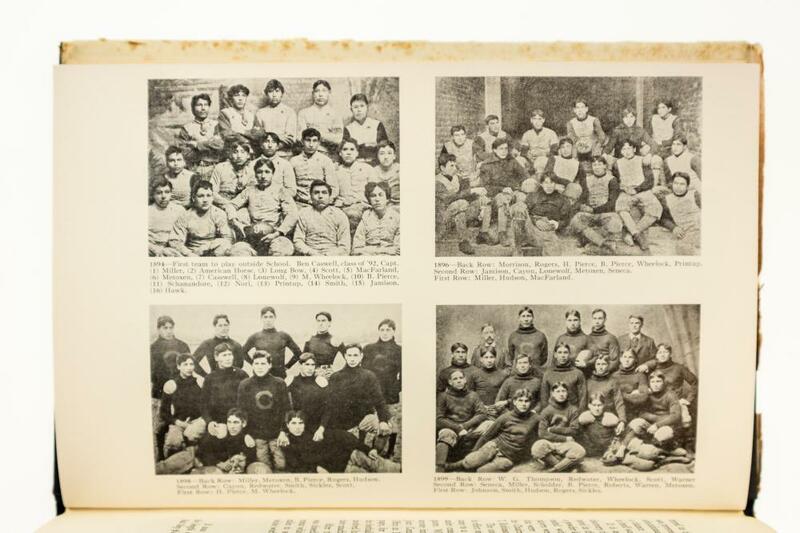 A member of the Sac and Fox Nation, Thorpe became the first Native American to win a gold medal for the United States. 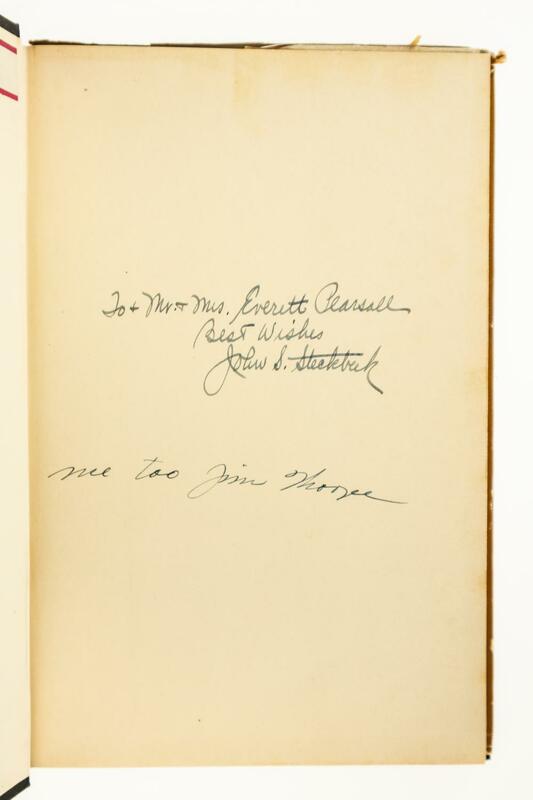 Considered one of the most versatile athletes of modern sports, he won Olympic gold medals in the 1912 pentathlon and decathlon, and played American football (collegiate and professional), professional baseball, and basketball. He lost his Olympic titles after it was found he had been paid for playing two seasons of semi-professional baseball before competing in the Olympics, thus violating the amateurism rules that were then in place. In 1983, 30 years after his death, the International Olympic Committee restored his Olympic medals. Thorpe attended the Carlisle Indian Industrial School, where he was a two-time All-American for the school's football team. 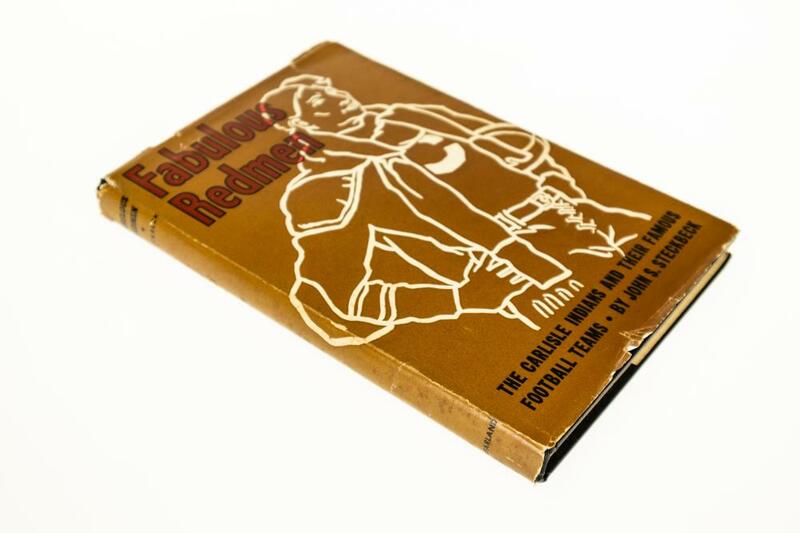 Condition / Notes: This book shows very well with strong graphics on the dust jacket. The jacket shows some age/wear, concentrated at the edges. 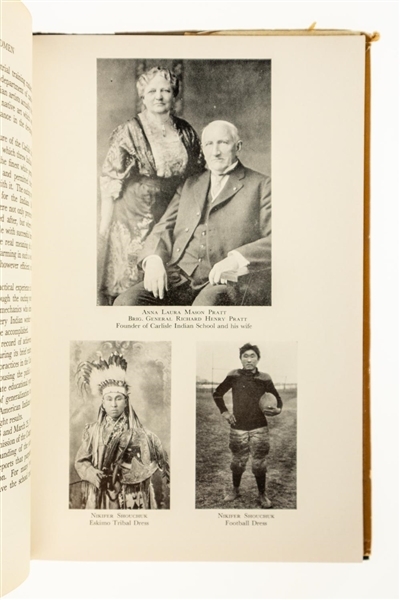 The book itself is bound in black cloth with red lettering to the spine and it shows modest age/wear, concentrated at the extremities. The binding is firm and secure and the pages are clean and bright. There is a previous owner's label on the front paste-down endpaper and the name on the label matches the name in the inscription from the author.